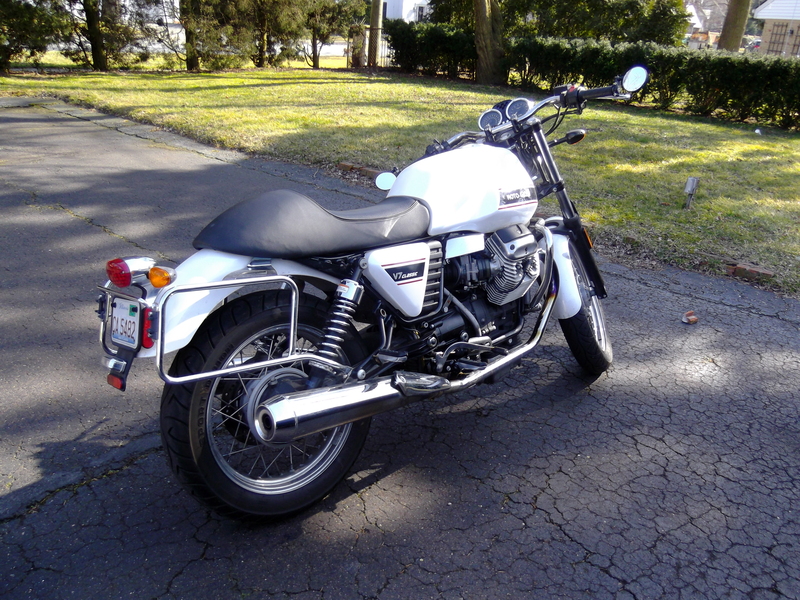 This entry was posted in bike reviews, Motorcycles and tagged Moto Guzzi, Moto Guzzi Review, Moto Guzzi V7 Classic, V7 Classic bars, V7 Classic cafe, V7 Classic clubman bars, V7 Classic modifications, V7 Classic mods. Bookmark the permalink. Any chance you can compare that set up to the bars on the V7 Racer? Being in Detroit, I haven’t seen a racer in the flesh yet, just pix. I CAN tell you that they’re cheaper! 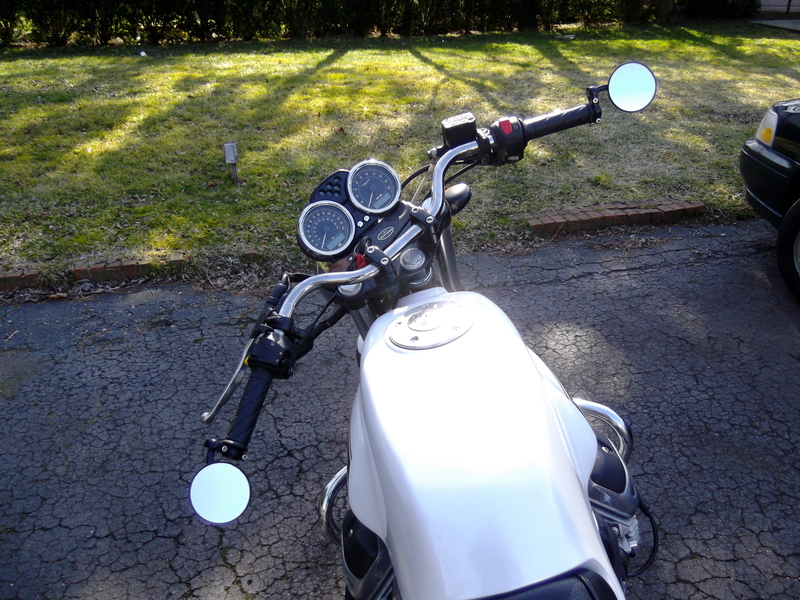 The mirrors are so close to the centerline of the bike, all I see is my own torso. Your bar-ends look like just the ticket. This is an interesting post to read, because you’ve gone the same way I did with with my V7. I fitted LSL “sports tourer” bars which look similar to your M bars, but perhaps a little narrower: 26.75 inches wide, 1.6 inch rise, 4.5 inch pull back. I also fitted a pair of Halycon bar end mirrors, and a Dart flyscreen, both of which are beautifully made and work really well, though it pushed my budget to 3 or 4 times what you spent! I sure enjoy the blog; reading your posts led me to stop in at Rose Farm Classics a couple of days ago to meet Jim and talk over getting Guzzi to keep in Midwest. Great guys; a great shop. Thanks for the blog. Hi Danilo, looks fantastic. I’ve thought about the same myself for my classic – are they a 7/8 or one inch bar? I’m in Australia and keen to get hold of some. Great to hear some updates on your bike too., and very happy that it is still running well! Been reading and re-reading your blog. I’m getting a Guzzi soon, but really can’t decide on which. It’s either a Breva 1200 Sport or the V7. I’m 6’3″ at 220, and was shocked when I threw a leg over the V7 how good it felt! I live about 25 miles north of Chicago, and will use it for occasional trips to the city. After the amount of time spent on your V7, any additional words of advice? I’d run the same bags and everything. Go see Jim. Barron at Rose Farm Classics in Woostock, IL. Talk to him and throw a keg over some bikes and see what “speaks” to you. You’ll know soon after if you’re on the right bike. I recommend 30L instead of 40L bags because if the way the wind hits them at speed. Really great reading your posts, and the V7C is looking like a proper cafè! Where did you get a hold of that single seat? I found it at corsaitaliana, but I was out of luck as they were out of stock.. Keep up the good work, your site has been a great source of tips. Got my seat from my Guzzi Dealer for $160. Took about 2 weeks. Any further mods or paint on the V7 Classic? 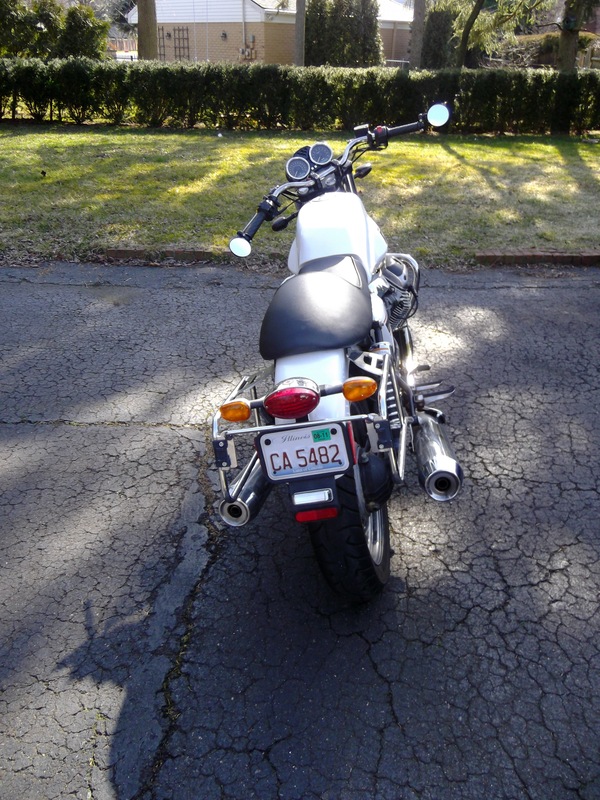 I’m going this evening to look at a low-mile 2009 model that a private party is selling, and have read all of your Moto Guzzi related posts with interest. Thank you for sharing your knowledge and experiences! 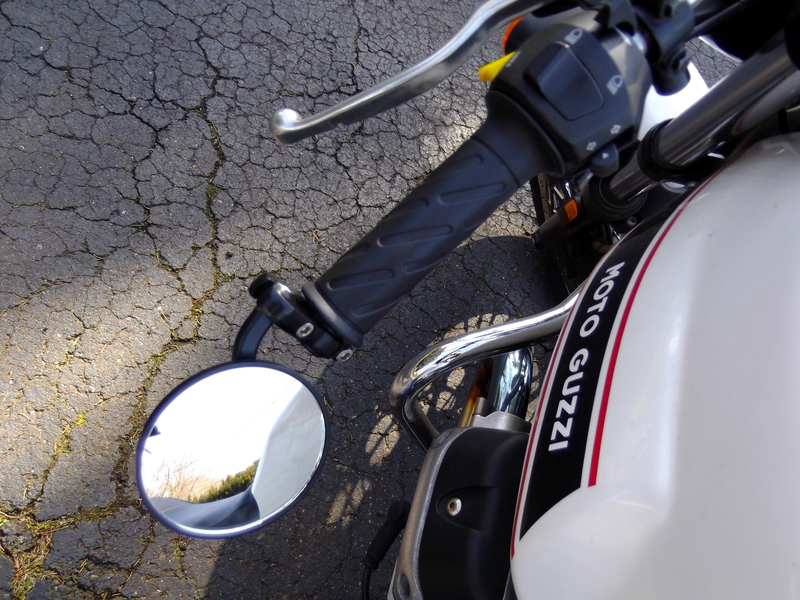 I’m definitely interested in adding bar-end mirrors after seeing your comments about poor visibility and vibration issues with the stock mirrors. Are these the mirrors you picked up? Those are the exact mirrors. Thanks for the reply. I’m going to try out the stock mirrors for a little while, and if I hate them, I’ll probably give the mirrors above a try. I really liked the V7 Classic I looked at last night, and agreed to buy it. The sale is just pending inspection at the local dealer. The tough part now will be waiting for decent weather to ride! Time to come back, Dan. Thank you so much for this more then complete V7 blog. 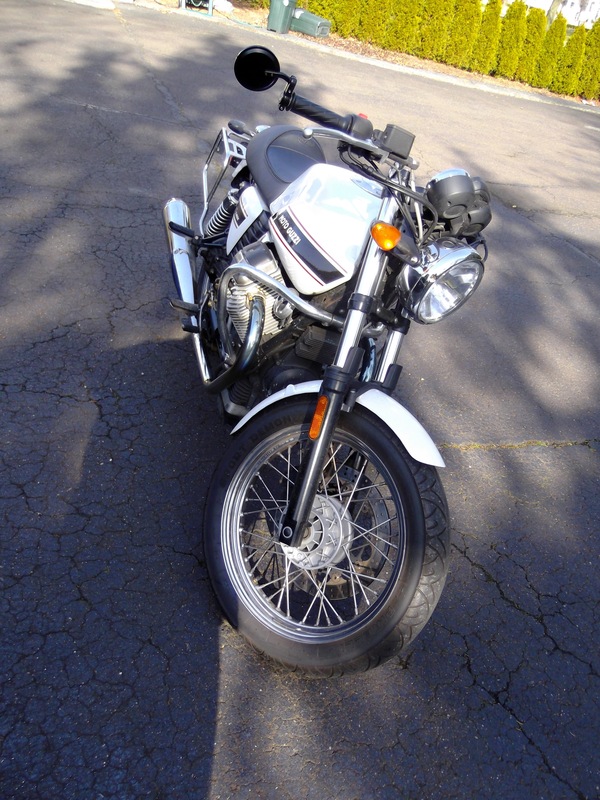 I am in the process of buying a new bike and i am torn between Bonneville, Thruxton, Scrambler ( all triumph) and since I’ve seen the V7 I cannot let it go…. money won’t let me look at the newer stone, so a nice classic is what i have to look at. At this moment, i say… All you write i can relate too and still so ething inside says… Should not you go for the thrumpers… I am 6,3 and 250 pounds so that kinda let me hang towards the triumphs.. but now i read you are a big guys too…. Still haven’t made the choice but you blog sure helped me a lot!